Green Bay Packers QB Aaron Rodgers in Monday’s 27-13 win over the Philadelphia Eagles completed 30 of 39 passes, a completion percentage of 76.9. It was the 25th game in his career that he completed 75% (or higher) of his passes in a regular season game. But what makes this stat all the more impressive is that in those 25 games that Rodgers completed 75% or more of his passes, the Packers were a staggering 24-1 in those games. 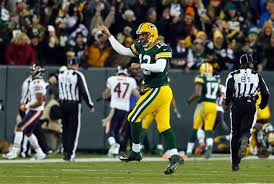 Obviously, a super accurate Aaron Rodgers is an important factor for success for the Pack. Let’s take a look at QBs who have used their passing accuracy to their (and their team’s) benefit. First, let’s look at the QBs who have had the most games competing 75% of their passes. It’s interesting to note that this past Sunday, New Orleans QB Drew Brees completed 28 of 36 passes (77.8%) in the Saints 49-21 win over the Rams. It was Brees’ 50th career game with a completion percentage of 75% or higher. That broke a tie he was in with Peyton Manning for most games in this stat. Here’s a look at the QBs that have had the most games where they competed 75% or higher of their passes. Both Brees’ and Manning’s teams had decent success in games when they completed 75% of more of their passes. Brees’ Saints are 43-7 in those games, while Manning’s teams were 43-6 when he completed 75% of his passes. There are, however, a couple of QBs whose teams were/are actually undefeated when they complete 75% of their passes in a regular season game. There have been 35 QBs that have 10 or more games with a 75% of higher completion rate in a game. Of those 35, two are undefeated in those games… Tom Brady and Ken Stabler. Brady’s Patriots are 25-0 in games when he completes 75% or more of his passes in a game, while Stabler’s team was 17-0 in games when he reached this mark. Let’s take a look at the QBs whose teams have won 90% or more of their games when they completed 75% of more of their passes in a contest (minimum of 10 games with 75% completion rate to qualify). For the record, there have been 43 times this season that a QB completed 75% or more of their passes in a game (minimum of 10 passes attempted to qualify). Three QBs are tied with four games each: Brees, Dak Prescott and Matt Ryan. Teams are 26-17 when their QBs completed 75% of more of their passes in a game this season.